These pillows feature the silhouettes of any two US states and have hearts stitched over your hometowns. Whether you've taken the morning commute or the path to adventure, sharing the road or going it alone, these pillows will be a welcoming reminder that home is where the heart is. 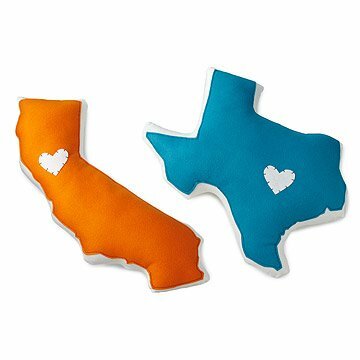 These handmade, geographic pillow pairs are squeezable depictions of your two favorite places. US state silhouettes are created in stylish colors on a white background, customized with a little heart stitched over your choice of city. The two pillows can represent the individual birthplaces of a couple, or the location of your home and favorite vacation spot. Or give one to a college-bound child as a reminder of home, as you keep one that marks this new place in their life. Handmade by Christin Morgan in Texas. Christin Morgan was born and raised in Tyler, TX where she studied dance and painting. A degree in Communication Design followed from Texas State University – San Marcos. After graduating with her BFA she packed up and headed West to continue her art studies in California. I bought this as a graduation present for my niece who is going to college out of state. When I received it, it looked like a middle school home economics project. I was very disappointed and since it is personalized, it cannot be returned. Bought a Michigan pillow for my husband. We currently live in Pittsburgh and he loves anything that reminds him of "home." His eyes lit up when he opened his birthday gift. Perfection. Buying these pillows was a fun treasure to have when my partner and I moved long-distance. We each have a pillow from where the other is living with a heart over the city. It's been fun to collect new states as we have moved around. We look forward to when we will get to move back together and have all of our pillows in a collection. Just thought it would be bigger for the price. Since I was imagining the pillow to be something a little more functional versus decorative, I was slightly bummed. Gave this as an anniversary gift and it was a hit. This product worked out excellent for the use which I purchased it for! I love my state pillow. My husband and I met in Ohio but we'll probably never live there again so I love this as a decoration to remember where we met. It's a great size and I get a lot of compliments on it. I will definitely be buying more from this site since I can attest to the amazing quality. Fun addition to our condo in Austin, Texas..fun colors.